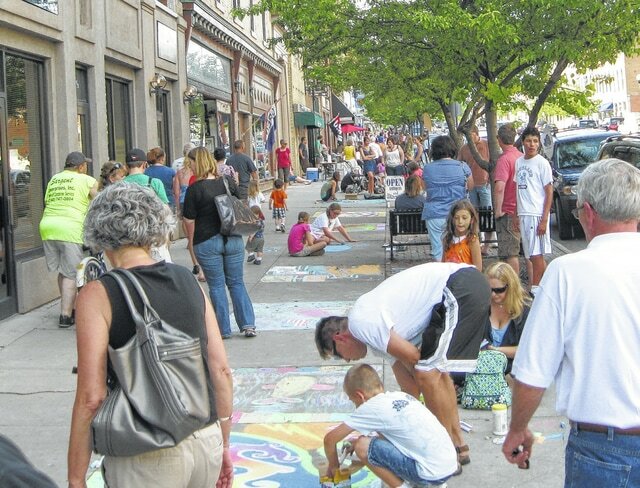 Sidewalk artists participate in a past “Chalk It Up!” chalk art contest in downtown Delaware. Main Street Delaware will hold its fifth annual “Chalk It Up!” sidewalk chalk art contest from 6 to 9 p.m. July 3, with artists of all ages invited to decorate the downtown with vibrant works of art. The contest will be Main Street Delaware’s First Friday event for July. “We will have chalk art contests, music, fitness demonstrations, dancing and games,” said Frances Jo Hamilton, executive director of the nonprofit Main Street Delaware. Those wishing to participate in the competition are invited to secure sidewalk space for $10 per square now through July 3 by visiting www.mainstreetdelaware.com to print a registration form. Forms also are available at Button Up handmade art gallery, 29 N. Sandusky St.
Artists are asked to bring their own chalk, she said, and then simply to begin working on their preferred sidewalk square — located on Sandusky Street between Spring Street and Central Avenue or on Winter Street between Franklin and Union streets —. Main Street Delaware volunteers will collect registration forms and number squares for voting. Artists are able to begin working at any time July 3, but must be finished by 8 p.m. to allow time for voting. Spectators will be invited to vote for their favorite sidewalk chalk creations in youth and adult categories, and the People’s Choice winners will win prizes. Little artists not participating in the contest will be able to make sidewalk chalk creations at no cost, using chalk provided by area businesses, she said. Funds raised as part of the contest will support future Main Street Delaware downtown beautification, education and family-friendly events. The July 3 event is sponsored by PNC Bank.